Two years ago I published a recipe for a Jerusalem and chestnut gratin, it is one of my favorite recipes and a go to whenever Jerusalem artichokes are in season. This year I had a new challenge, as my friend became vegan I decided to make a different version of this fabulous gratin. I used purple potatoes, for their beautiful color, Jerusalem artichokes (also known as Sunchokes), shallots and pre cooked and packaged chestnuts. To replace the milk, cream and cream fraiche I used my new favorite creamer: Cashews! For the best cashew cream I soak them over night in water, and then puree to a smooth “milk”, but if you are pressed for time place a handful (about 1/2 a cup) of raw cashews in a bowl of hot water, replace the water as they cool down, or keep on a low simmer for an hour – two. The nuts are ready when they are soft and juicy, then you can puree them in a blender. start with a little water and add more if needed, you want it to be thick, not runny. start by slicing all vegetable as thin as you can, then mix all ingredients but bread crumbs in a large bowl.adjust seasoning and layer in the dish you intend on using for baking. if you want to make distinct layers, you can mix the cashew cream in as you layer the vegetable, make sure it gets all the way in between the pieces and layers.sprinkle crumbs on top, cover and bake for 35 min, remove cover and bake about 15 min more or until golden in color.let the gratin cool down a little before digging in. It’s been months that I have been planing on making these cookies. It all started after I had Thini cookies at Sugar-Daddy in Tel Aviv earlier this year. I was talking about making these cookies for so long that it seemed like it wasn’t going to happen. After looking up recipes online and in my cookbook collection and not coming up with anything that seemed promising, I tried to improvise… The first batch of cookies was too hard, so I added some butter and replaced a 1/3 of the spelt flour with almond meal. And here you go, a winner recipe, the cookies came out tasty and crumbly, perfect served with tea or on their own. So good! Thini is basically ground up sesame seeds and Silan is a date syrup, the combination of these two flavors is unreal. First thing is making sure you are using high quality Thini paste, I prefer Thini that comes from the middle east, it just seems to be better than any local brand I tried. 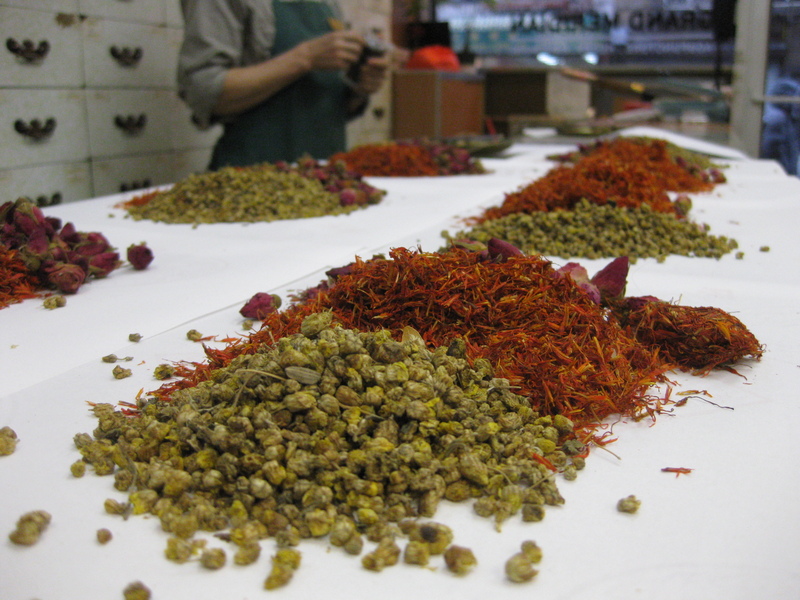 The Silan should be as natural as possible, and without preservatives. 1 1/2 cup flour, I used spelt and almond meal, 1 cup spelt and 1/2 almond. Start by placing the thini and butter in a sauce pan over low heat, mix until well combined. In a large bowl mix the thini-butter paste with the silan, chopped pistachios, 1 teaspoon cinnamon, a few drops of vanilla extract, 1/2-1 teaspoon of ground cardamon and the salt. Slowly add the flour and mix by hand until a soft dough is formed. Using your hands, form small balls and place on a baking pan, since the dough is soft the cookies will spread, so make sure they are spread out. Bake for 10-12 minutes, just until slightly brown and take out. Let cool before trying to move the cookies or they will fall apart. The cookies are extremely soft at first but they will harden as they cool down. Chinatown’s pharmacies always fascinated me, yet very rarely I would actually step into one and explore. 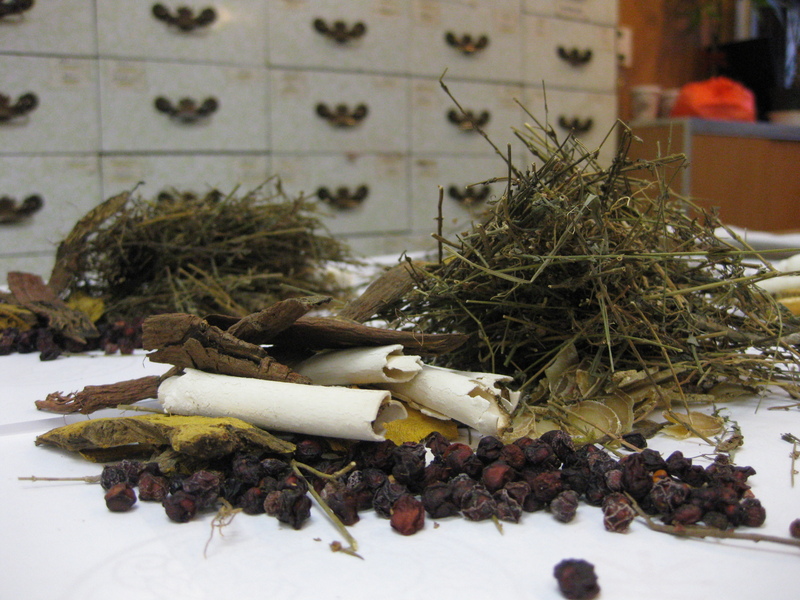 Today I had to pick up my bi-weekly supply of Chinese herb and so I got to hang out in the store and soak up some of its magic. 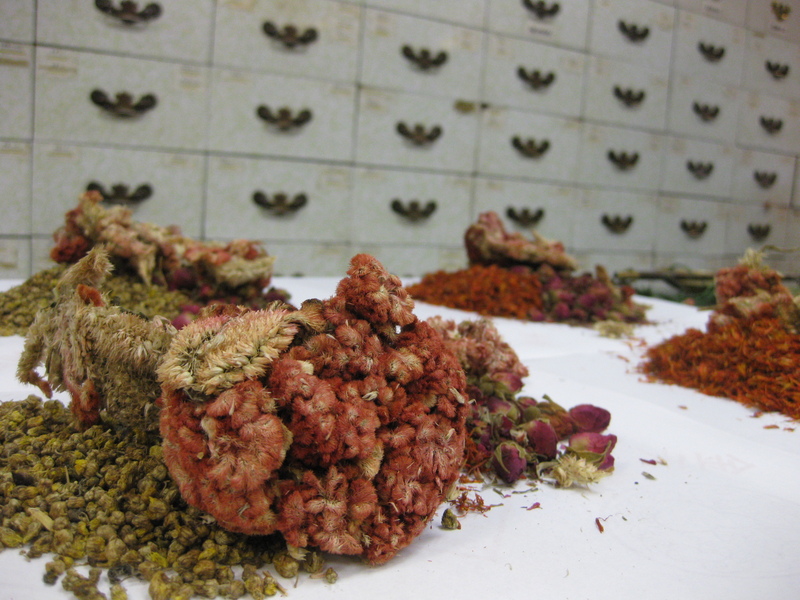 One step into Kamwo pharmacy and you are in a totally different world, on the counter are 7 pieces of paper and on each various herb, flowers, tree shavings and other dried up wonders. All are stored in the hundreds of drawers behind the pharmacist and are being carefully measured by hand, using weights and a scale. 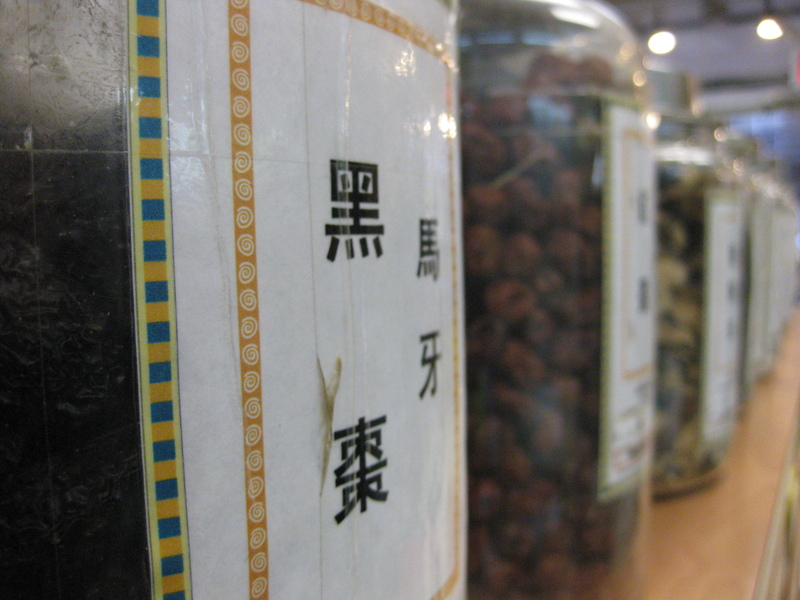 In 2 gallon jars around the room are more dried up berries and mushrooms, different roots and probably some animal parts, alongside the large variety of teas. The idea that there is a whole completely different approach to medicine and healing, an entire system that analyze our body’s energies and connect every illness and ache to imbalances in our organs, diet, environment and our emotions is captivating, and the more I know the stronger I feel about accepting this idea and learning more about it. My friend Ben cooked dinner last night, and I am so happy I got to eat it! Aside from being a talented chef, he is also one of the funniest people I know, an amazing LSAT teacher and all together a pretty awesome human being. Thank you, friend, for sharing your food with us. 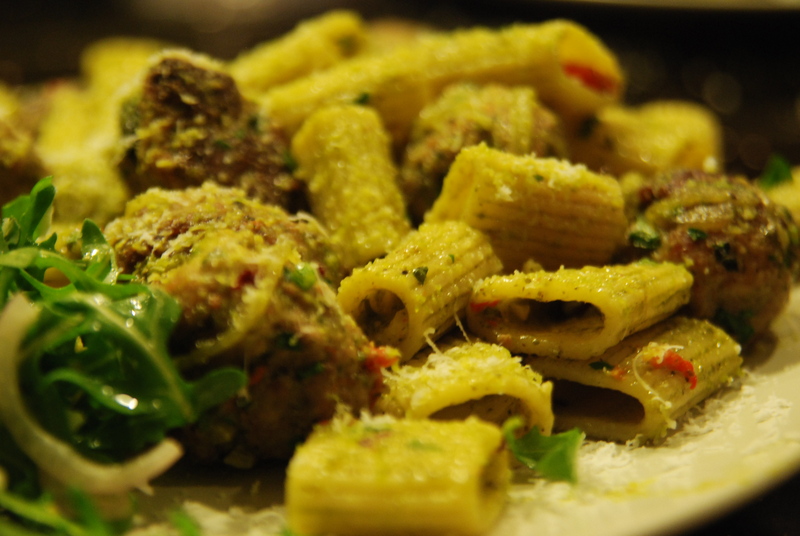 Pasta with home-made mix herb pesto and lemon sauce, lamb meat-balls, sautéed spinach and arugula salad. I promised Debbie about a month ago that I will make some lentil soup and put the recipe up, but this entire time I just wasn’t inspired to cook any lentils, then I saw these green french lentils at the coop and knew that today is the day. 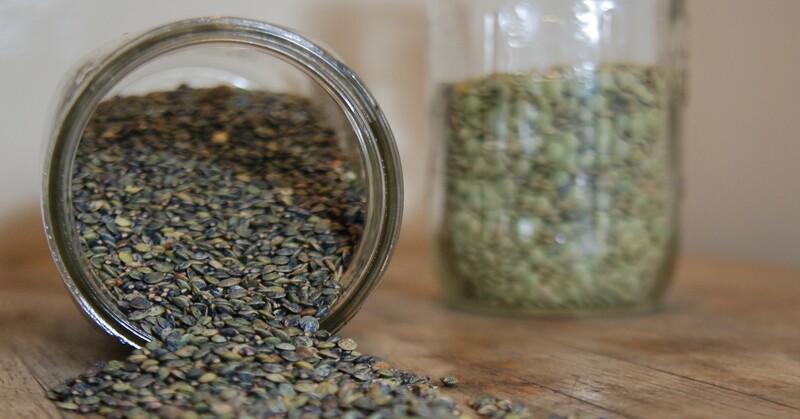 Like other legumes, lentils are low in fat and high in protein and fiber, but they have the added advantage of cooking quickly and they don’t require any soaking. 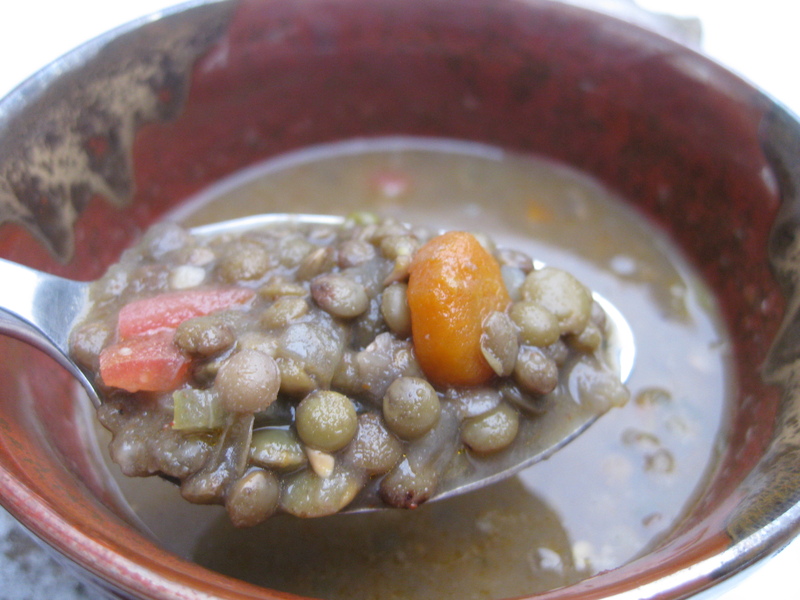 Green lentils are usually the ones I go for, the french ones are more delicate and take longer to cook. 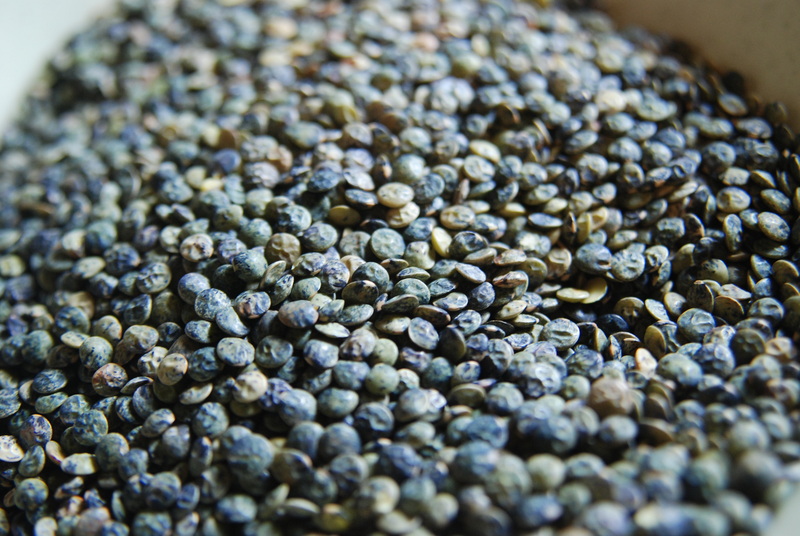 all lentils should be rinsed and picked through for stones before cooking. Oh, and by the way, they will take longer to cook if they are combined with salt or acidic ingredients, so add these last. start by sweating the onion, carrot, celery and turnip in 2 tablespoons of oil, add black pepper and a pinch of salt just to get some liquid out of the veggies, add garlic, potato and lentils. Add liquid, cumin, paprika and a bay leaf. bring to a boil and lower to simmer. cook for 40 minutes to an hour, depending on the lentils you are using. Keep checking that there is enough liquid in the pot, the lentils soak up a lot of liquid as they cook and the soup will slowly turn thicker, its up to you to decide how thick you want it to be. Taste a few lentils after the first 40 minutes and see if they are completely cooked and soft, make any adjusting to the flavor if needed, if the lentils are ready add the lemon juice, salt and the chopped tomato, cook for 5-10 more minutes discard the bay leaf and serve, garnished with chopped parsley. fennel is one of the earliest food i can remember, it seems like it was always on our dinner table, for the most part served chopped, raw in a lemon dressing. i always liked the flavor of fennel and its hairy leafy part as well, it has that anise like flavor, and though i’m not at all into licorice i am very much into fennel. 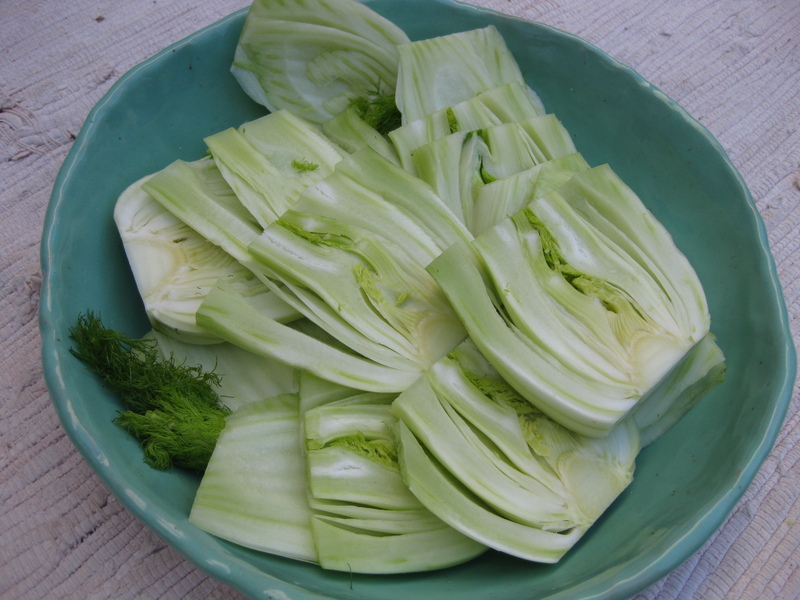 there are many dishes you can make with fennel, i have been dreaming on fennel ice-cream ever since someone at the coop was telling me about her experiments with an ice-cream maker, but on my plate today, something a little less time-consuming: braised fennel. 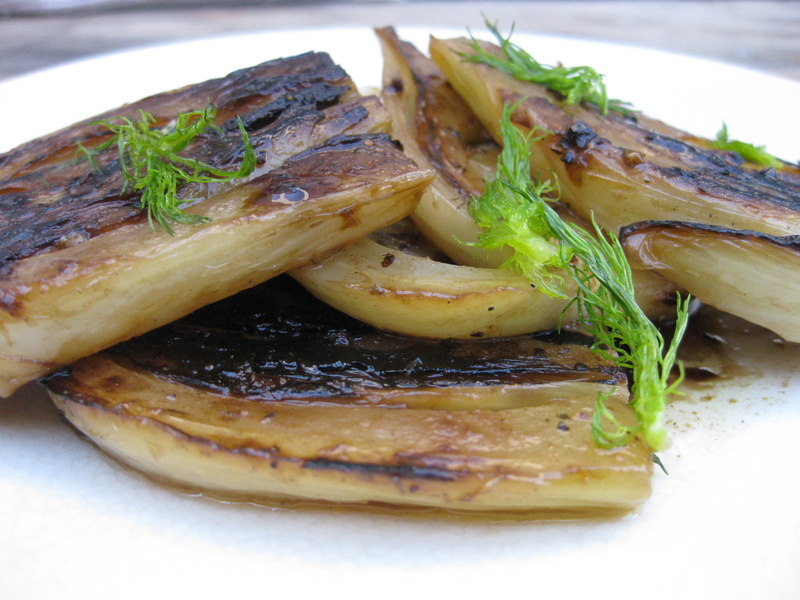 braised fennel is delicious, charring it before you braise it will bring out some hidden sweetness and will take it to a much happier place. i start by taking the tops off, saving the leafy part for garnish, then slicing it length wise in order to keep the bulb sort of intact, then i gently toss it in olive oil, salt and pepper and place it in a hot cast iron to grill it, flipping about 4 minutes in or when it turned brown, for a total of 8-10 minutes. if you need to work in batches do so, don’t over-crowed the pan. once all pieces are nicely charred place them back in the pan and add about 1/2 cup of white wine, let it boil for a minute or two and add equal amount of chicken or veggie stock, salt, pepper, some chili flakes, a few threads of saffron and the juice of half an orange or 1 meyer lemon. 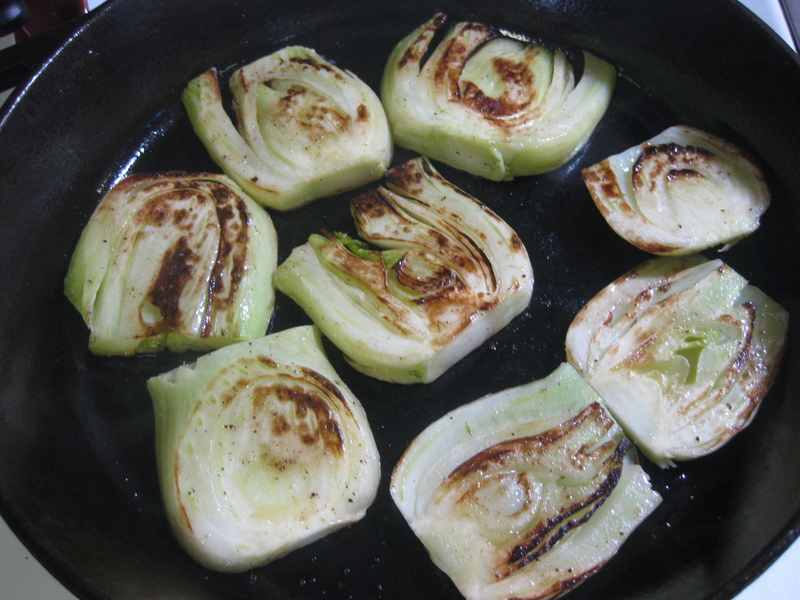 cover and let simmer for about 15 minutes until fennel is soft. garnish with some beautiful fronds. 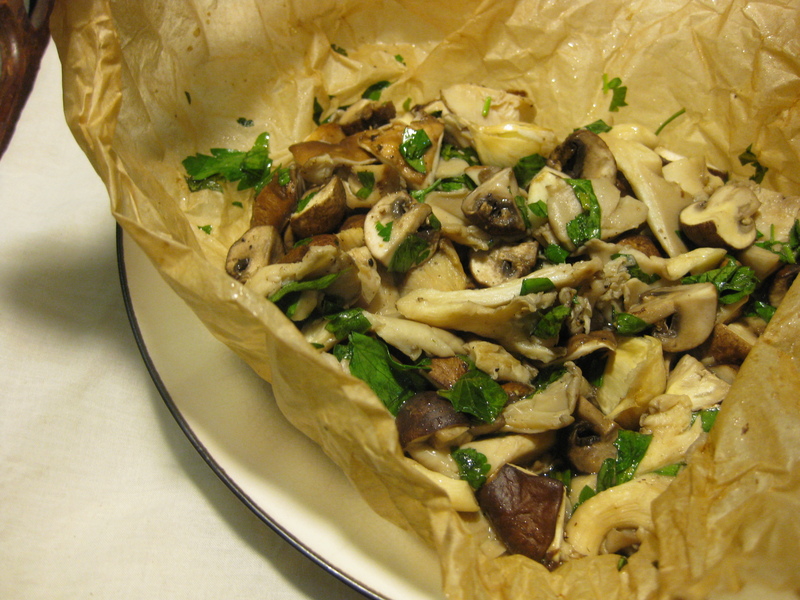 Another recipe from the new french cook book I got last week, mushrooms baked in paper. yum. cut a baking paper to a rectangular 18-by-11-inch ( 45-by-28-cm). 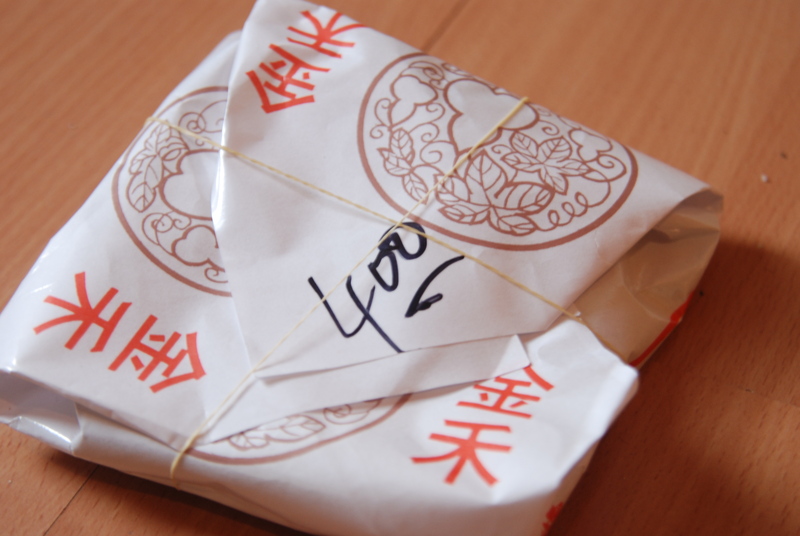 fold the paper in half crosswise, open the paper and coat with butter, place in a baking sheet. 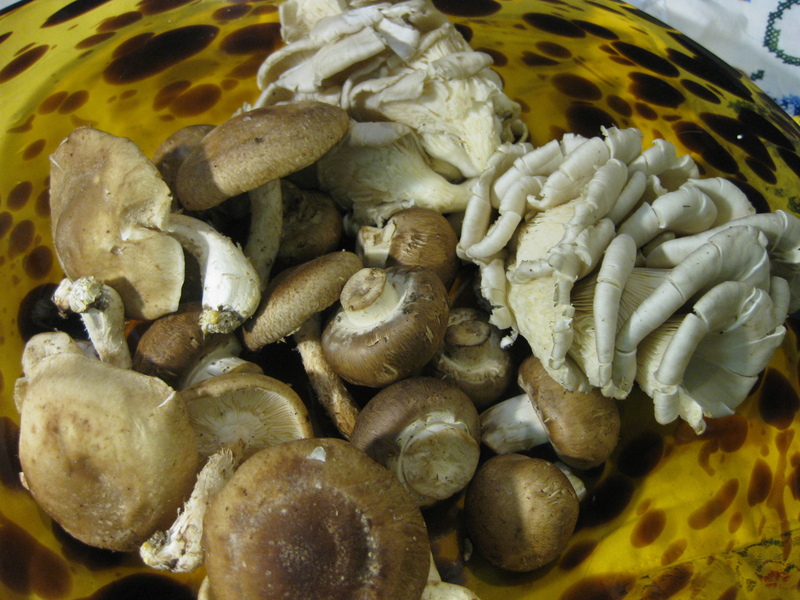 cut 1 lb of mixed mushrooms into bite size and place in a bowl, add 1/2 teaspoon of salt, 1/4 teaspoon of pepper, 1 tablespoon of butter cut into pieces, 1 teaspoon freshly squeezed lemon juice and 2 tablespoons chopped parsley and toss well. spread the mushrooms on half the paper and fold the second half over the mushrooms, fold the edges over twice, working your way to the edges, ending with a twist on both ends. place the package on the baking sheet and bake until the package is puffed and the mushrooms are cooked through 15-20 minutes, carefully open the package and serve at once.